Wayne Duggan for U.S. News: Tech investors are very familiar with the three main classes of cloud computing, software-as-a-service, infrastructure-as-a-service and platform-as-a-service. However, within the next eight years, the robotics business could give rise to a new $200 billion cloud services industry. The robotics-as-a-service era is rapidly approaching. The shift toward automation will no doubt raise demand for robotics hardware, but Loup Ventures analyst Andrew Murphy says the robotics software industry could be even bigger. Loup estimates that the global robotics hardware business will expand from roughly $20.9 billion in 2016 to $73.0 billion by 2025. 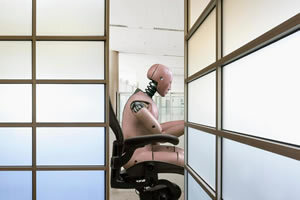 However, the firm projects that the robotics software industry could grow to $140 billion in size by that time. Murphy says robotics hardware may soon be commoditized, leaving software as the true long-term growth opportunity. “For that reason, we believe investing in companies with a software- or service-focused business model will be the more attractive way to play the growing robotics theme given these approaches are more scalable and, arguably, more defensible,” Murphy writes.